Yorkshire puddings are one of C's all-time favourite foods - it's the stodgy and crispy, yet soft and light, consistency that really appeals to her. For the uninitiated, Yorkshire puddings are made from batter (unsurprisingly, given that they're also known as "batter puddings") and are said to originate from the northern English county of Yorkshire, although apparently there's no real evidence to support this claim. In any case, they prove very popular in Yorkshire - and indeed, in the rest of England - and are almost always served up with traditional British Sunday roast dinners. When A and C cooked Christmas dinner for C's family this year, the general consensus meant that roast beef replaced the traditional turkey on the menu. With batter puddings traditionally served up as an accompaniment to beef (and along with roast potatoes, vegetables, stuffing and so on), we seized the opportunity to try making our own. Having never attempted them before, C's family did warn against this risky strategy on Christmas Day and suggested relying on the mass produced variety which were sitting in the freezer. 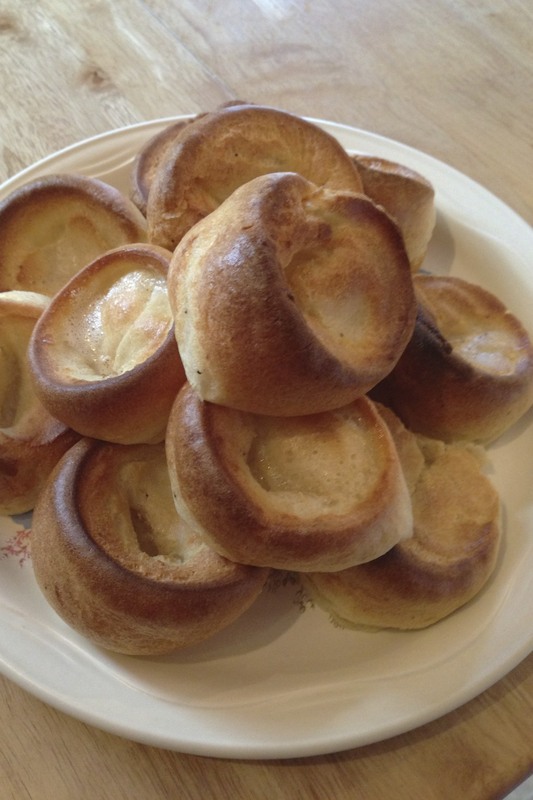 Luckily, however, our Yorkshires were a huge success, and were met with murmurs of satisfaction at the dinner table. While we'd like to suggest that our success was due to our cooking abilities, we're willing to concede that it was probably the recipe that made all the difference: we used the ever-reliable Delia Smith. With relatively little effort, we produced puffy, light, soft Yorkshires that were brown and crisp at the top - and went down a treat. 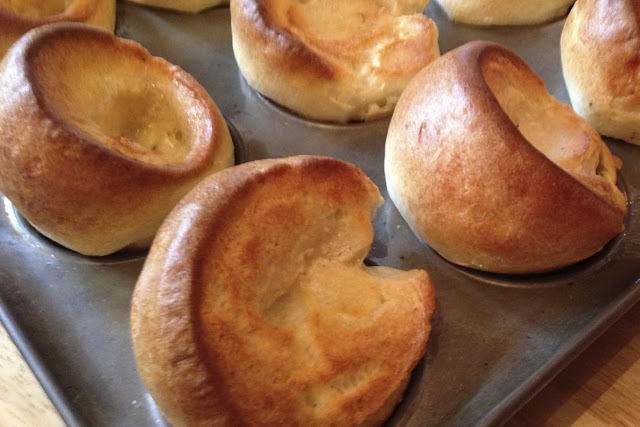 Yorkshire puddings essentially come in two varieties: mini ones, which you make in a muffin tin, and full size ones, which are the size of a small cake and are cut up at the table. We decided to make miniature ones as with all the other trimmings we'd made they were more than enough. 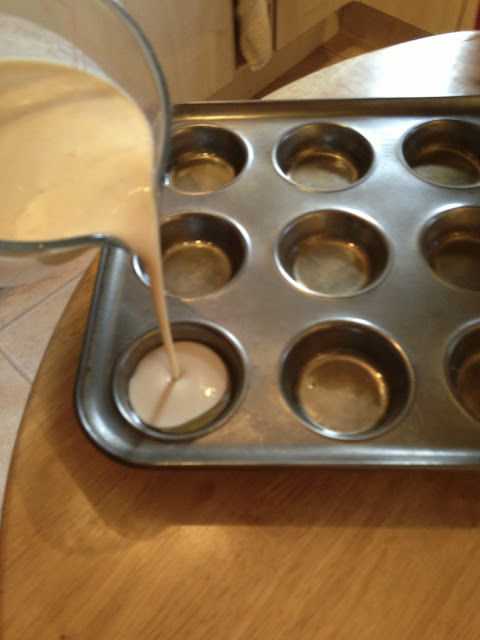 First, take a muffin tin or cake tin, and spoon a little fat into the tin. Pop into the oven on gas mark 7 or 220C while you make up the rest of the batter; you want the fat to be piping hot and bubbling by the time you add the mixture. Heat is key, use cold fat and they just don't rise. Make up the batter by sifting the flour into a bowl and make a well in the centre. Break the egg into it and beat, gradually incorporating the flour. Next, beat in the milk, 2 fl oz (50ml) of water and seasoning (tip: use an electronic hand whisk here, as this will do it in seconds). You don't need to leave the batter to stand, so just make it when you're ready to cook the pudding - about 25 minutes before you're ready to serve the meal. Spoon or pour the mixture into the tin, which should have the hot fat bubbling in the bottom of each depression. Pop into the oven and allow 25-30 minutes to rise and become crisp and golden before serving. You'll know when they are ready as they puff up out of the tin. Remove from the tin. Be careful as they sometimes stick and you may need a sharp knife to cut them loose and serve hot. One of the trademark features of Yorkshire puddings are their height; according to the Royal Society of Chemistry (!? 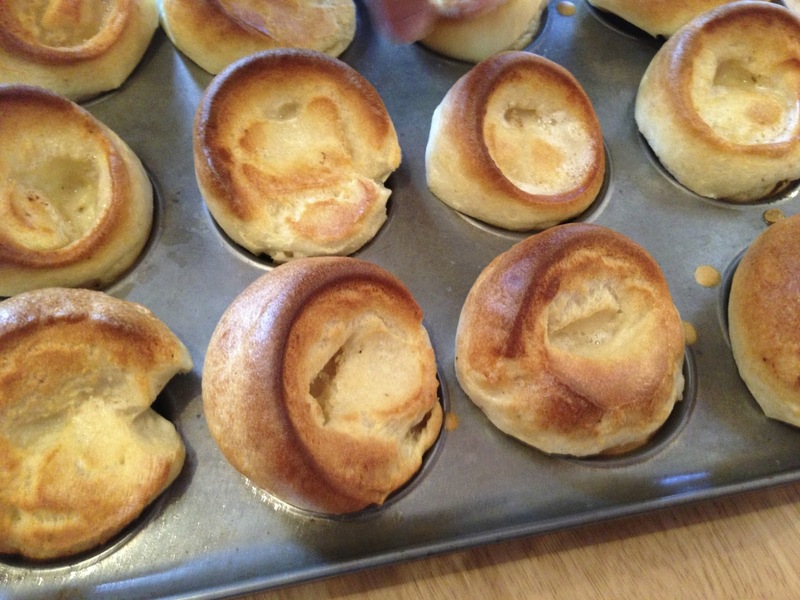 ), a Yorkshire pudding technically "isn't a Yorkshire pudding unless it's four inches tall'. Serve them up as soon as possible, though, as they'll lose their height and their crunchiness very quickly. If you need to leave them standing for a while for some reason, the trick here is to make them up with 2 eggs instead of one: this is what many restaurants do, and while it'll produce stiffer, crunchier versions of the puds, they'll keep their height. They look fab, beautifully golden on top! - I think it's important to have a fail safe Yorkshire pud recipe in your repertoire! Thank you, They did turn out really yummy! If you're looking for a foolproof recipe for batter puddings, they don't come much better than this one.